You thought drawing games couldn't get more creative didn't you? Try drawing on your own forehead! The game Skribble Head does just that. You get to wear a white board on your forehead as you attempt to draw what's on your card. Now you have a major excuse why your drawing looks awful. The best part is practically no one can draw well on their forehead so everyone is on a level playing field. Skribble Head will have you laughing for hours while you rack your brain trying to understand the scribble that being drawn. Great for three or more players, this game is perfect as a large party game. Give Scribble Head a try today and you'll be glad you did. If you are the first player to reach 15 points by successfully drawing pictures on your own forehead then you'll be the winner. 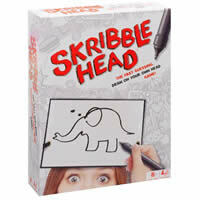 Skribble Head will include 1 timer, 1 drawing board with elastic headband, 1 numbered die, 1 dry-erase marker, 275 drawing objects and the official Skribble Head game rules and instructions. Please keep in mind that the official Skribble Head party rules and instructions could be different depending on the game version you have. The rules below are some of the exact directions on how to play Skribble Head. Share with us your comments, funny stories, tips, advice, strategies, creative ways to play, questions about how to play, problems with the rules or anything you want about Skribble Head. All submissions will be reviewed within 24 hours. Click here to add your Skribble Head comments.